Delivered Long Beach 27/4/43; Sioux City 4/5/43; Smoky Hill 10/6/43; Dow Fd 15/6/43; Assigned: 560BS/388BG Knettishall 17/6/43; MIA Bordeaux 5/1/44 Pilot: Norman Kempton, Navigator: Stan Plytynski, Bombardier: Bill LaForce, Radio Operator: Lou Mostardi, Engineer / Top Turret Gunner: Emil Taddeo, Tail Gunner: Hamp Nicholson (6EVD); Waist Gunner: Ray Evtuch, Waist Gunner: Joe Derouin (2POW); Co-Pilot: Paul Davis, Ball Turret Gunner: Eldridge Saulter (2KIA); battle damage, crashed Cartujac, near Saint-Laurent-et-Benon, Fr. MACR 3118. 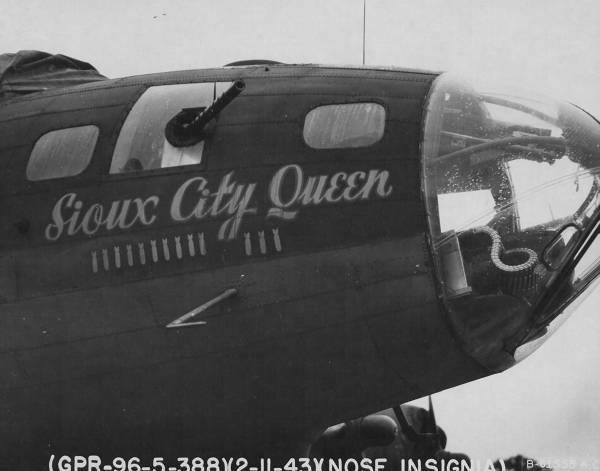 SIOUX CITY QUEEN.